When you are looking at the figures of drive speeds, you will remark that there are two separate notations that look a lot alike. Mbps stands for Megabits per second, while Megabytes per second are written as MB/s or MB per second. There are 8 bits per byte: therefore, the ratio is 8 to 1. The same is in correlation to Gigabits that are expressed as Gb and Gigabytes that are expressed as GB. When you see that the b is lower case, you will note that this is referring to bits: when the B is capitalized, you will realize that this is referring to bytes. It must be stated that is rather difficult to measure exactly the real speed of a hard drive. They are slowed down dramatically when they are reading or writing small files. Data that is on the outer perimeter of the platter is read faster than data on the inner rings. As the drive becomes more full, naturally it slows down even more. 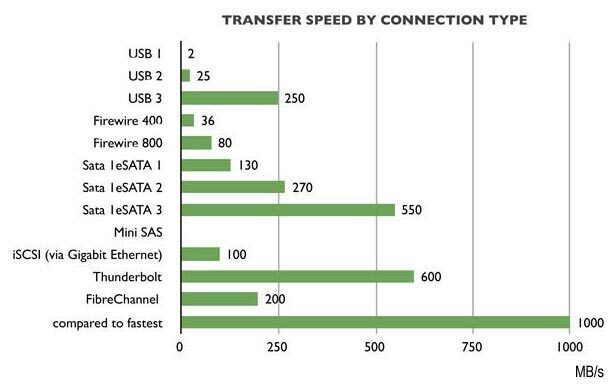 Take into consideration the fact that a drive with 7200 RPM should be able to outperform a FireWire 800 connection, because the peak data transfer is normally above the output power of FireWire 800, which is 98 MB/s. But this only happens in very rare situations. Usually the drive will serve up data at a much more slower pace. A drive works more quickly and efficiently during the transmission of larger files, because the drive can actually read and write them. For smaller files, the drives uses a lot more time to find the files, which is why the drive is then slower. SSDs seem to be able to handle small files much better because no moving parts are need to find the stored data. But smaller files still do slow down SSDs.